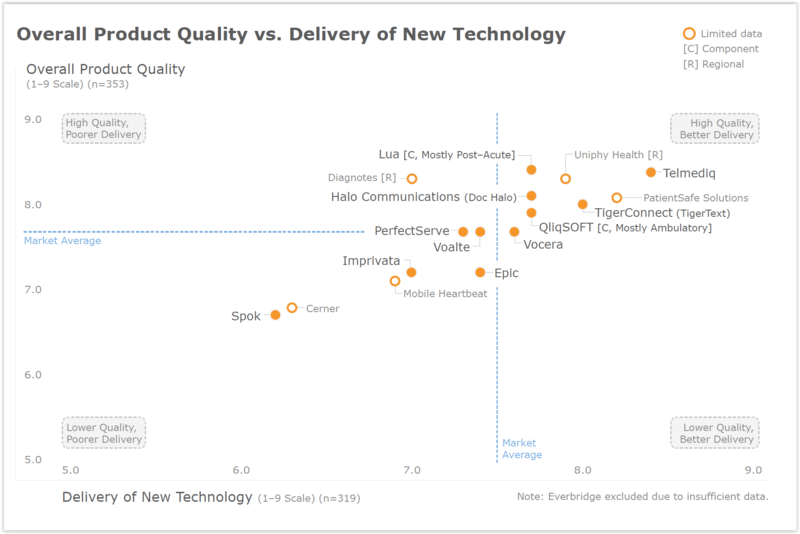 SEATTLE—October 31, 2018—In the latest KLAS Decision Insights Secure Communication report, Telmediq received the clinical communication industry’s highest marks for quality and post-purchase reality. Telmediq, the 2018 Best in KLAS winner for Secure Communication, topped the list in this newest report for Overall Product Quality and Delivery of New Technology. Released today, Decision Insights Secure Communication 2018 draws on performance feedback from current customers, as well as purchasing insights from 100 acute-care and ambulatory organizations, to evaluate vendor performance and which vendors are most often considered in this rapidly evolving industry. In addition to product quality, Telmediq also received high scores for Executive Involvement and Quality of Training. Telmediq’s customers reported high confidence in the vendor’s ability to meet the acute-care market’s growing desire for communication platforms. Telmediq’s cloud-based solution integrates with numerous clinical, IT and Telecom systems to eliminate workflow silos and coordinate care in both the acute and ambulatory healthcare environments. The product’s robust scheduling, call routing, and patient-centric approach to communications were among the functionalities often highlighted by customers. All together, these factors contributed to a high retention rate, high customer considerations, and an overall performance score of 93.1 out of 100. Ninety-seven percent of Telmediq’s current customers say they would buy the solution again. The No. 1 KLAS-rated vendor for secure communication platforms 2018, Telmediq streamlines clinical communication and workflow so health systems can improve patient safety, throughput and satisfaction. The Telmediq healthcare communications hub pulls together disparate hospitals systems—EMR, lab, nurse call, clinical alarms, call centers and call schedules—into one powerful and integrated platform for HIPAA-compliant communication and care coordination.